Top 5 Argentines of 2014: Carlos Tevez (Juventus), Javier Mascherano (Barcelona), Sergio Aguero (Manchester City), Lionel Messi (Barca), Di Maria (Real Madrid-Manchester United). Argentina is one of the top national side of 2014. With players like Lionel Messi, Angel Di Maria and Sergio Aguero in the squad one could not argue on that. The below Argentines have been vital for their clubs and country this year. Carlos Tevez still makes the list despite of not being a part of the World Cup but because of his performances for the club Juventus. He lifted the first Serie A title which made him a champion in four different countries. The 30-year-old is still in form, he has scored 10 goals and is the top scorer in the Italian League. The former Liverpool star arguably the best player for Argentina in the World Cup. He did not score like Lionel Messi but tackled like no one else could. Messi may have won the Golden Ball but Mascherano's toughness thought the summer’s World Cup deserves applause. Sergio Aguero has suffered a lot this year with injuries. The Manchester City forward netted vital goals which brought the Premier League title to Etihad stadium once again last season. Currently, he is out with an injury but is still on top of the goal scoring chart in the Premier League with 14 goals. Aguero has also smashed many goals in the Champions League and is hoping to return before the campaign’s knockout stage takes place. Four time Ballon d’Or winner misses the first spot this time. Despite of struggling several times this year he still managed to scored vital goals for club and country. He scored 58 goals in 66 games for Barcelona and Argentina. He scored four vital goals in the World Cup which led them to the World Cup Final. Messi finished as a runner up three times this year La Liga, Copa del Rey and World Cup. However, he still performed individually. 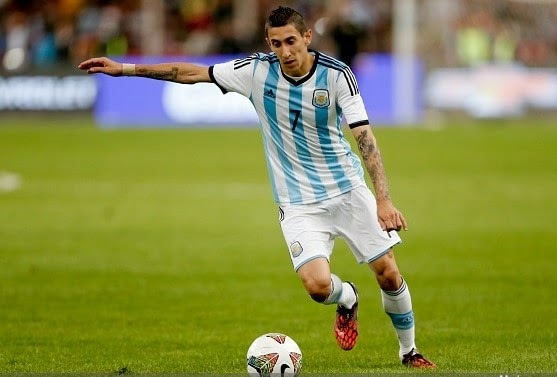 Angel Di Maria beat Lionel Messi to get the number one spot. The Manchester United star might consider 2014 as his best year. Making several assists to lead Real Madrid towards their tenth Champions League trophy and then helping his national side in the starting games of the World Cup as he later picked up an injury which caused him to miss the last few games including the final. In the summer he became the most expensive player in the history of Manchester United. This is absolutely an amazing year for him. di maria deserved that spot!